Launceston captain Tom Rawlings hailed his side's 39-24 win over Taunton in National Two South as "awesome". The victory saw the Cornish All Blacks climb to seventh in the table. "It was an awesome game and I'm really proud of the boys. To come away with five points and send them back to Taunton was a job well done. "They'll be pretty annoyed that they've come away with nothing. I'm over the moon, but we've got to build on this," Rawlings told BBC Radio Cornwall. Tries from Lewis Paterson and Liam Yeo helped Launceston to a 18-10 lead at half time, but Gordon Howells' converted try soon after the break got Taunton within one point of the Polson Bridge side. However, two tries from Josh Lord in 10 second-half minutes, either side of one from Ben Hilton, settled the game in Launceston's favour before Edward Lee got a last minute consolation for the visitors. "Everyone's smiling and that's the type of rugby we want to be playing, finishing off games in style like we did today," said Rawlings. 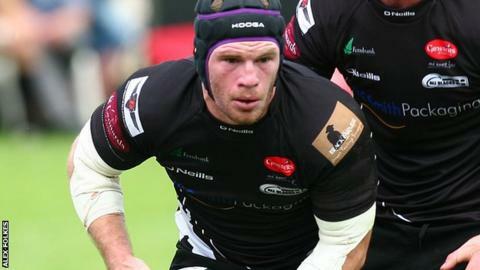 He offered sympathetic words to former Launceston winger Aron Struminksi, who now plays for Taunton as he looks to make a name at Exeter Chiefs. "Aron's a great friend and a good player but he didn't do anything today. I think he must be a little bit disappointed," Rawlings added. "Maybe they didn't give him the ball as much as we used to - I know we used to try and find him and give him the ball because he can create stuff. He can change a game, but they didn't use him and we played our game well."